LONDON— Prime Minister David Cameron today joined Baroness Sayeeda Hussain Warsi to meet with active members of the Somali Diasporas ahead of the international conference on Somalia on Thursday 23 February 2012, at Lancaster House in London to listen to their thoughts on the prolonged conflict in Somalia and identify possible ways forward with the assistance of the international community. This was the first meeting of its kind whereby the Prime Minister invited members of the Somali Diasporas to partake in a serious discussion about Somalia at Downing Street. After going through security checks we proceeded to number 10, which has on its rather heavy black door letter plates reading “First Lord of the Treasury”. Inside the building there are noticeable black and white pictures of Prime Ministers, Winston Churchill being most obvious with two pictures and excluding Cameron who has to wait to hang up his own till he leaves office. A warm welcome by Baroness Warsi followed in the Pillared Room decorated with fine Persian carpets and few portraits including one of Queen Elizabeth I, which hangs over a fire place. After a short introduction we preceded to the Cabinet Room with at its heart an oval shaped large table perhaps with the intention to provide a clear view for the Prime Minister who sat at the centre of the table. Short thereafter the Prime Minster joined us posing an engaging posture and a friendly smile while shaking hands with the guests around the table. The UK government is right to engage the Somali Diasporas on the critical task of finding lasting solutions for the problems in Somalia. Engagement of local communities is important to our countries endeavors to counter any challenges we face and this meeting brought potential partners together. The Prime Minister acknowledged that this should be the way forward and suggested to continue to work with communities more closely. 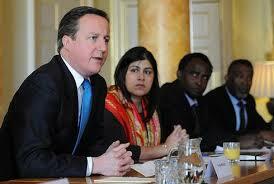 British Somalis must support the London conference and rally behind the Prime Minister. But the Somalia problem is messy and complex with a worsening situation over the last 20 years that cannot be solved overnight. Ismail Noor wanted to know whether or not Britain is ready for the task and asked Cameron “how long is UK prepared to stay involved”? Cameron gave a considered answer and explained that UK is here to help and facilitate ways forward. Further suggestions made by the group include the ineffective management of development and humanitarian aid to Somalia. A number of people pointed out the vast corruption and mismanagement of international aid. Salah Shek Osman said “international and humanitarian agencies want to “remote control” local charities and if you do not adopt their approach there is no place for you in their organization”. Surely aid is important, particularly in the Somali regions where poverty is prevalent. However, a shift from aid to trade is desirable where appropriate to tackle its structural dependency on the long term. Political representation is an area in need of significant development. On this matter, Waris Mohamoud said, “that gender inequalities need to be addressed as women outstrip men in numbers but are almost invisible from most decision making processes” and Ilham Gassar suggested that a balanced age representation in the political process matters given the fact that Somalia is a young nation with 60 percent of the population being under 40 years. Pressing the Prime Minister on the question of representation Salah Shek Osman asked Cameron whether or not he would engage in dialogue with Al shabaab. Cameron’s answer was swift and argued that it is unrealistic to talk to a terrorist organization that associates itself with Al Qaida. Instead the Prime Minister expressed his support for the recent Garowe Agreement, which deals with the broader political progress through the so-called “Roadmap to end the transition” when the mandate of the current Transitional Federal Government (TFG) terminates in August 2012. Ironically the Garowe Agreement, which is based on the unpopular 4.5 Formula that is meant to represent clans evenly across the Somali regions precisely comes short to deal with equal representation in the political development. It further raises questions about the selection of officials, which are undemocratically appointed and continues unfair treatment of minority clans. These issues must be addressed. The challenges British Somalis are facing in the UK where also highlighted. In particular great concerns were raised about young disadvantaged Somalis who are prone to radicalization while posing a threat to the UK and themselves. It was argued that these young Somali people often lack self-esteem and in order to earn respect they become more susceptible to all kinds of crime. There are, however, many young Somalis who are doing very well and are positively contributing to the British society and that needs to be acknowledged and celebrated. After the Prime Minister left Baroness Warsi continued with the discussion and skillfully chaired the remainder of the meeting. Warsi’s background and vast experience in the field was evident in the way she handled the questions and managed to progress the discussion occasionally and appropriately drawing on her Pakistani and immigrant background without upsetting or disappointed the strong characters across the table. Further suggestions were to be aware of the divisions within the Somali communities and some reference was made to the FCO’s approach of having “desks and offices for each Somali region”. However, others applauded the FCO’s approach and consider this as a way of acknowledging the rich diversity of the Somali people that is often misunderstood. On the question of Somaliland’s independence Cameron explained that this conference is not about the recognition of Somaliland but to strengthen and further develop the positive achievements it made so far. Ahmed Adare noted that it is fitting for Somaliland to support their brothers and sisters in Somalia and share and transfer the knowledge and skills, which have made Somaliland relatively peaceful for over 20 years. To conclude the general consensus is that something has to change in Somalia, as it cannot continue the way it is now and this conference offers a great opportunity to make that a reality. Britain’s initiative is very much welcomed by the Somali Diasporas in the UK. However, Somalis insist to draw lessons from the past conferences, which have been far from effective. More importantly this should be a Somali solution and political process and progress should be Somali-led. Mohamed holds a BA (Amsterdam) and MA (SOAS, London), and is currently perusing a PhD at Goldsmiths researching the experiences of young Somalis in London as transnational active citizens. Further, Mohamed is the current chairman of Nomad International, a charity that strives to assist Somali youth in Britain and various institutions in Somaliland in the developments of health, education and crime prevention programs. He is also a committee member of the London Somali Youth Forum (LSYF) that aims to advocate for the Somali youth in London.